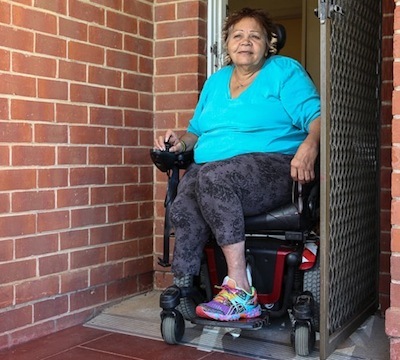 The housing needs of Indigenous Australians living with a disability are being fully investigated for the first time in a groundbreaking multidisciplinary research program by the University of Adelaide. Figures from the Australian Bureau of Statistics indicate that one in every two Aboriginal and Torres Strait Islanders live with some kind of disability or long-term health condition. Because of chronic under-reporting the real figure is believed to be much higher. Researcher Dr Elizabeth Grant says a paucity of research into the housing experiences of these people means there is a serious lack of information on how they cope. "We know that housing and living environments are fundamental to a person's quality of life, even more so when they have to live with a disability," says Dr Grant. "We also know that housing for Indigenous people is often of poor quality and overcrowded. What we don't know is what their experiences and needs are and that makes it very hard to set appropriate housing policy. "It's imperative that we collect baseline data to better understand the issues for informed decision-making." A specialist in Indigenous education, Dr Grant is part of a six-strong research team which also has expertise in the key areas of Indigenous health and medicine, architecture, landscape architecture and geography. The team has secured significant funding from the Australian Housing and Urban Research Institute (AHURI) for the 18-month research project. > Remote - Yalata Aboriginal Community in South Australia's far west. > Rural - Raukkan Aboriginal Community on the southern shores of Lake Alexandrina in South Australia. > Urban - Geelong, Victoria. Mr Alwin Chong, who works in the area of Indigenous health, says the study will examine the lived experiences of housing and infrastructure through the eyes of disabled individuals, their carers and families. "We really want to give Aboriginal people a voice in our research," he says. "Anecdotally we have some idea of the sorts of issues they face, such as mobility and lack of community infrastructure. "We've heard that some people are trapped in their homes due to a lack of housing modifications, sometimes the primary caregiver also has a disability and some individuals have been forced to move away from their family due to inappropriate housing." The University study follows a report by the First Peoples Disability Network stating that the experiences of Indigenous people with a disability need to be urgently documented. The type of disability can vary enormously from physical, which can include hearing and visual loss, to intellectual and cognitive impairments caused by alcohol abuse and glue sniffing. In some Aboriginal communities hearing loss is reportedly as high as 60 per cent. Another member of the research team, housing and planning specialist Professor Andrew Beer, says appropriate housing and infrastructure for people with a disability is a critical issue for all Australians, but particularly the Indigenous population. "This is important research which has never been looked at before and is clearly a topic that is very important in closing the gap for Indigenous people," he says. "The fact that it's funded and supported by AHURI means that there's a greater chance the findings will be put before policymakers who in turn will bring about change. "It's also very timely with the National Disabilities Insurance Scheme being rolled out because funding is more likely to be made available for solutions in a whole range of areas." The research team intends beginning its work in May with a questionnaire and interviews with key stakeholders, including community leaders and health service providers. This will help identify some of the issues and also people with disabilities and their carers who are willing to talk about their experiences. The information will be used to develop case studies in each of the three research areas.